Some disappointment for our friend Nick Hunt in the Edward Stanford Travel Writing Awards, the results of which were announced at an event at London’s National Liberal Club this week. The winner was Down To The Sea In Ships: Of Ageless Oceans and Modern Men , Horatio Clare’s account of the ordinary men that place their lives in extraordinary danger on container ships on the high seas. As winner, Clare received a cheque for £5,000 and a specially commissioned hand-made globe by master globe-makers, Lander & May. 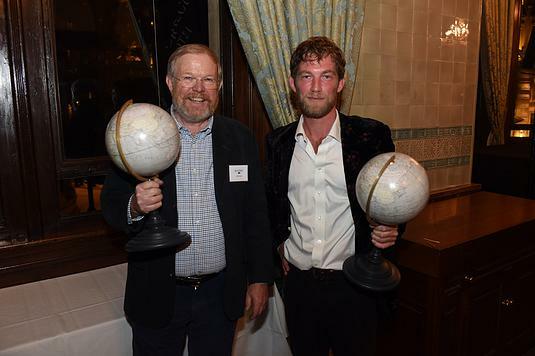 Best-selling travel author Bill Bryson was also honoured at the Awards when he received the Edward Stanford Award for Outstanding Contribution to Travel Writing. Selected from public nominations by specialists at high street and independent bookshops, including Waterstones, Blackwell’s, Daunt Books and the Hungerford Bookshop, this is the first time the Award has been presented. Tony Maher, Managing Director of Edward Stanford Limited, said “Bill’s elegant, witty and amiable prose has been entertaining readers for many years. From adventures walking the Appalachian Trail, to defining the British better than any Brit has ever managed, he has a turn of phrase at once insightful and hilarious. As well as receiving his own handmade globe trophy, Bryson’s name was inscribed on a commemorative globe which will go on permanent display at Stanfords, Covent Garden. The names of future winners will be added to the globe in due course. Maher also announced that the 2016 Edward Stanford Travel Writing Awards ceremony would move to coincide with the Stanfords Travel Writers Festival, which will take place at the Destinations Show, Olympia in February 2017. Stanfords entered into sponsorship of the Stanford Dolman prize earlier this year, in association with the Authors’ Club and donor, Rev. Dr. Bill Dolman, doubling its funds and adding it to the newly created Edward Stanford Travel Writing Awards, alongside the Edward Stanford Award for Outstanding Contribution to Travel Writing. This entry was posted in After the Woods and the Water, Uncategorized and tagged Edward Stanford Travel Writing Awards, Nick Hunt, Stanford's on October 3, 2015 by proverbs6to10. Willie Scraggs , I’m inclined to agree with you. Nick Hunt’s book was a very good read, especially for a debut.Better luck next time Nick.Looking forward to the next book. He’s working on it Paul. Mr Hunt can take consolation from the fact that very few great writers of any genre have ever won a literary prize – these events are usually no more than a publishers’ puff to increase the sales of their latest stock. Mr Bryson may be well known, and he may be a delight to Edward Stanford Limited, but his compositions and reflections are scarcely more than superficial, let alone literary. I suggest that he is an overrated writer, popular mainly with those who are not particularly well read; another sign of his weakness is his not infrequent resort to vulgarity.